Are there Web robots out on the Internet telling us that the world will end in 2012? Nathan Jones: I have a technical background on the Web from professionally building websites and applications. Your book 2012 explains the Web Bots Project and its involvement in the whole 2012 end of the world scenario. Web bots are very important to search engine optimization, but that they can predict the end of the world is just crazy talk. Dr. Hitchcock: I am the most technologically challenged person in the world, so someone else could probably explain it better than I could. But, these web robots, also called crawlers or spiders, go out and find information and how they are related to one another for indexing. Supposedly, they were originally created for economic forecasting, which they haven't been very good at obviously. The particular Web bots made by the Web Bots Project were getting all this feedback about 2012 being an ominously important year. The big problem with using Web bots is that all the information placed on the Internet was put there by people. We generated it, and a lot of it is incorrect. 2012 being an ominous year according to the Web Bots Project is really just prophecy by majority vote. Google "2012" and you will find most of the articles are about the end of the world in 2012. 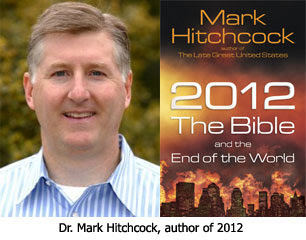 Some then automatically conclude that the end of the world is going to occur in 2012. In reality it is self-fulfilling. People who believe Web bots predict the world ending in 2012 claim they can tap into a preconscious out there and forecast this. But, again, it is another kind of grasping at straws. What Christians have is the Word of God — the Bible — and it really does tell us the future.